This is an easy and quick to make soup. It does use a slow cooker which is perfect for busy days or the days you’d rather spend with family than in the kitchen. The secret for the speediness of the soup is to use a frozen soup vegetable blend. The brand I use has potatoes, tomatoes, corn, green beans, celery, okra, and carrots. In a large skillet over medium heat cook the ground beef, garlic, and onions until the meat in browned and the onions are soft and translucent. Drain off any fat. 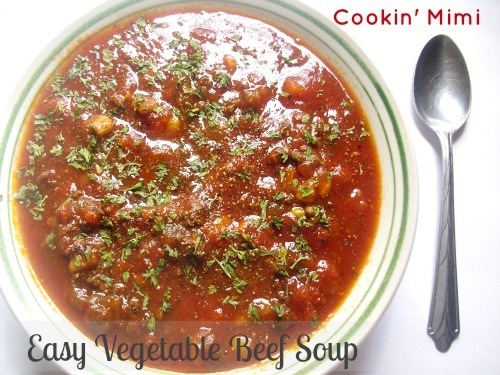 Place beef and soup vegetables in a 6 quart slow cooker. Pour vegetable juice cocktail over the contents, season with salt and pepper, and stir to combine. Cover and cook on low for 6 to 8 hours. You can cook this on high for about half the time but it tastes better with a longer cook time. Season bowls as needed with salt and pepper. This looks really good, I’ll have to give it a try!